What is it? It’s a wooded 32-acre tract with twelve 1–3 story office buildings. Current zoning allows for various commercial and office uses with maximum 4-story building height. This Planned Unit Development (PUD) rezoning initially requested high-rise (up to 17 stories) office buildings, 300 multi-family residential units, retail, restaurants, and a 2-acre park. Where is it? It’s at the southeast corner of Spicewood Springs Road and MoPac; head west on Anderson Lane, cross over MoPac and Austin Oaks is on the left. Austin Oaks currently generates 4,000 vehicle trips per day; PUD zoning would generate 20,000 per day. High-rise buildings at the edge of MoPac would loom over Allandale residents 500-ft. away. The heavily wooded tract would lose several heritage trees and most of the protected and smaller trees. Austin’s Imagine Austin comprehensive plan designates the Anderson Lane Station at MoPac and Anderson Lane a “Neighborhood Center,” so the PUD densities proposed on the NWACA quadrant could be repeated in Allandale, Balcones, and North Shoal Creek. In the news: Links to articles about the Austin Oaks PUD and the PUD ordinance are listed below. Neighborhood activists dedicated to protecting the community and schools encourage responsible commercial development within conventional zoning standards; see the nopud.weebly.com blog. Send feedback: Allandale residents may send feedback [Email address: allandale.neighborhood #AT# gmail.com - replace #AT# with @ ] with “Austin Oaks” in the subject line indicating whether you’re For, Neutral, or Against the PUD. Provide your name and address (for residency confirmation only). Timeline of events follows (most recent first), with links to documents about the proposed PUD. 2016-Jan-12 Visions & Values Workshop: 11:30 a.m.–1:30 p.m. If you missed the December workshop, here is another opportunity to provide input. Residents of neighborhoods surrounding Austin Oaks (Allandale, Balcones, North Shoal Creek, NW Hills) are invited to attend this workshop to provide input on what you would like to see at this site and to learn about the upcoming charrette. 2016-Jan-08 OSM Development Continues: There is a draft list of OSMs created by the Working Group and a list of OSMs from the 16-Dec. V&V Workshop. Additional OSMs will be gathered at the 12-Jan. V&V Workshop. Following the second workshop, the charrette Working Group and the charrette facilitator, Doug Farr, will outline a framework for the final OSMs. Using that framework, the Working Group’s OSMs and those from both V&V workshops will be consolidated into a single set of OSMs. The consolidated OSMs will be presented on the first day of the charrette and are expected to evolve further. The Working Group and Doug Farr are working hard to finalize and will publish the OSMs to the Austin Oaks charrette web page and emailed to ZAP Commissioners as soon as possible. 2016-Jan-05 Status Report to Zoning & Platting Commission: The current zoning case will expire on 08-March, so it will have to go before ZAP prior to their 14-March meeting; at this time it is doubtful the case will proceed at that time. Commissioners were given an overview of community input opportunities (info sessions, workshops, charrette week). Commissioners requested a list of stakeholders, list of public event attendees, list of OSMs, all of which will be provided shortly. During the charrette, one of the designs will illustrate development potential under current zoning (creatively, not as an ugly mass) in addition to three other designs that take into account top neighborhood concerns (traffic, trees, and building height). All designs will be subject to pin-up reviews on Tue-26-Jan, followed by design refinements based on components as selected by public input during all three evenings, and then consolidated into one final design on Fri-29-Jan. The ultimate zoning designation, which may include conventional zoning, conditional overlays, restrictive covenants, development agreements, and PUD—in short, all of the zoning designations available today—will be derived by implementing the land use plan into the CoA zoning process. Items and scenarios possible solely under a PUD will be identified. 2015-Dec-16 Vision & Values Workshop #1: The first of two Vision & Values (V&V) Workshops was held from 6:00–9:00 p.m. at St. Matthews Episcopal Church. Approximately 50 neighbors participated in tabletop exercises to enumerate their objectives and strategies for future redevelopment of Austin Oaks. Results will be posted following the second V&V workshop on 12-January. 2015-Dec-07 AO Working Group Meeting: To optimize communication and progress, meetings now include steering committee and working group members (composed of key stakeholders). Discussion focused on agenda and logistics for the upcoming V&V Workshops, slight refinements to OSMs, and further stakeholder analysis. & 02 Community Information Meetings: To accommodate varying schedules, one session was held during the day and one in the evening. Approximately 50 neighbors attended each session. The meeting handout is available here and the presentation slides are available here (both courtesy of NWACA). 2015-Nov-17 AO Steering Committee: Finalized pre-charrette public meeting times and locations; selected 19-Nov for press release timing and contact (Ben Luckens); continued OSM refinements; charrette week plans. Discussed post-charrette implementation: documenting the zoning development framework for a land use plan as basis for the final zoning ordinance. Community Information Meetings: Please attend one of these meetings to learn about the process and how neighbors can contribute to the Vision and Values Workshops. Neighborhood representatives will be there to provide information and answer questions. Neighborhood Vision and Values Workshops: Please participate in one of these meetings to provide input. Charrette Design Workshop: As the workshop schedule is finalized, additional information is forthcoming about how neighbors can participate. January 24-29th at Congregation Agudas Achim Social Hall, Dell Jewish Community Campus, 7300 Hart Lane [NOTE: the venue was changed from the Meridith building at Austin Oaks to Agudas Achim]. 2015-Nov-09 AO Steering Committee: Reviewed: workshop schedules and venues; press release and single point of contact; grant funding; clearly stated requirements for continued OSM refinements, iterative process, and innovation. 2015-Oct-27 Working Group Formed: A working group was established, charged with planning the charrette, informing neighborhoods about the process, and engaging the community in identifying values to guide a collaborative design. Four Austin Oaks (AO) committees were populated: Steering, Community Involvement, Official Interface, and Logistics. Leads selected were NWACA resident Ben Luckens as project manager, TBG Partners as local design team, and Doug Farr as design facilitator. 2015-Oct-07 Neighborhood Reps Met with Spire Reps: Jon Ruff, President of Spire Realty, and Spire’s counsel Michael Whellan reiterated the desire to suspend PUD activity at the city’s Planning & Zoning Department in order to conduct a charrette, engaging neighbors to identify concerns. As expressed previously by Spire’s former counsel, Steve Drenner, everything is on the table, including the potential to withdraw the PUD application in favor of conventional zoning. Neighborhood reps were asked to identify three possible charrette leaders by our next meeting, tentatively scheduled for 27-Oct.
Charrette 101: So what on earth is a Design Charrette? In a nutshell, it’s a multi-day design exercise that brings stakeholders together with a multidisciplinary team of designers, engineers and other specialists to plan the site through a collaborative process. Throughout the charrette, stakeholders provide input and feedback to the design team, and various development scenarios are reviewed against agreed-upon objectives and measures, refined and revised as appropriate. The outcome of the charrette is a consensus-based design for the site which can be used to guide the redevelopment. 2015-Oct-01 New Counsel to Meet with Neighborhoods: Michael Whellan (attorney with Graves Dougherty Hearon Moody) representing Spire Realty, called a meeting of neighborhood representatives to discuss how to move forward and involve the community regarding future development of Austin Oaks. The meeting is tentatively scheduled for 07-Oct.
2015-Sep-15 Zoning & Platting Commission: 6:00 p.m. in council chambers at City Hall, 301 W. 2nd St. (Please note, access to the City Hall parking garage has changed; the entrance is now on Guadalupe, and the exit is on Lavaca.) Adjacent neighborhood associations continue to request that the PUD be denied, but we expect planning & development staff to request another postponement due to incomplete review of the Traffic Impact Analysis (TIA). Update: Staff is not ready to provide feedback at this time. The applicant now requests an indefinite postponement in order to conduct a charrette. After more than an hour of discussion, commissioners voted to grant an indefinite postponement, with regular staff updates starting on 06-Oct pertaining to the status of the TIA and the charrette process. 2015-Sep-08 Community Meeting on Austin Oaks: 7:00–8:30 p.m., at the Austin Board of Realtors Building, 4800 Spicewood Springs Road, Balcones Civic Association invites all 4-corners area residents to an information session where CoA planning & zoning staff will talk about the PUD process and field questions. 2015-Aug-13 PUD Updates: You can review the developer’s latest changes to their Land Use Plan (LUP) here and their responses to staff review questions here. 2015-Jul-08 Meeting with City Staff: ANA and NWACA neighborhood representatives Kata Carbone and Joyce Statz met with Tori Haase, Matthew Lewis, Matt Dugan, Kathleen Fox, and Jerry Rusthoven to discuss the neighborhood’s main points of concern, particularly as the proposed development relates to Imagine Austin. 2015-Jul-07 Zoning & Platting Commission: As we anticipated, the Austin Oaks PUD case was granted another postponement. The case is slated to go before the Environmental Board on August 19th, and then back to ZAP on September 15th. *NWACA declined to participate in a group letter, but issued their own resolution opposing the PUD and requesting a community engagement process. 2015-May-30 Four Corners Alliance: Meeting of Allandale, Balcones Civic, North Austin Civic, and North Shoal Creek N.A. representatives. Of note was discussion about a robocall on May 17 & 18 to District 10 residents that some were calling a “push poll” (an ostensible opinion poll in which the true objective is to sway voters using loaded or manipulative questions). Next steps included a proposal that a facilitated meeting (or charrette) be held and that the alliance maintain a unified voice in recommending that ZAP deny another postponement. 2015-May-15 Zoning & Platting Commissioners McDaniel and Seeger, District 10 Council member Gallo, District 7 Council member Pool met with neighborhood association representatives and area residents to discuss impacts of the proposed development from the neighborhood’s perspectives. 2015-May-06 ANA hears updates to development proposal: Steve Drenner, principal of Drenner Group, provided an overview of their latest changes to the Austin Oaks development plan during ANA’s May Executive Committee meeting. A comparison of key issues follows (see the 2015-May-04 timeline entry below for links to documents related to PUD Proposal 2). Focus turned to specific details such as the possibility of transplanting protected trees, screening unattractive parking garage structures, potential building surfaces to minimize visual annoyances (reflected glare and heat, light trespass, etc. ), all of which the Drenner Group expressed interest in exploring further. Representatives of the four corner neighborhoods will continue discussions with council members Gallo and Pool, commissioners, city staff, and the Drenner Group, with anticipated opportunities for wider participation in a public forum. 2015-May-05 ZAP hears updates to development proposal: The Drenner Group will provide an update to Zoning & Platting (ZAP) commissioners on Tue-05-May at 6:00 PM (at which time, see the May ZAP agenda, watch the meeting live or watch later). In advance of the update, Balcones Civic Association (BCA) contacted ZAP commissioners to voice their neighborhood’s unequivocal opposition to the PUD (see BCA to ZAP). NWACA representatives met with ZAP commissioner Rahm McDaniel and council member Sheri Gallo to discuss NWACA’s survey results and key concerns. Mr. McDaniel and Ms. Gallo offered to help the neighborhood come together on this issue. NWACA also met with the Drenner Group and asked them to develop a communication dialog plan for the neighbors, to explain the type of development that can be done under current zoning, to explain the use of PUDs, to provide more information about the latest plans, and to gather feedback from the community. NWACA compared previous and current aspects of the PUD here. 2015-Apr-10 Austin Oaks PUD Report from District 10 Austin City Council Member Sheri Gallo: “At their April 7, 2015 meeting [watch here], the Zoning and Platting (ZAP) Commission received a briefing on the status of the proposed Austin Oaks Planned Unit Development. Commissioners were informed that the Northwest Austin Civic Association (NWACA) conducted a survey of their neighborhood based on the developer’s December proposal. The Drenner Group informed the Commission that they were waiting for the results of the survey and would provide the Commission with an update at their May 5, 2015 meeting. The Planned Unit Development must be posted for action, including postponement, by the ZAP Commission on or before June 16, 2015. 2015-Apr-09 NWACA Survey Results: NWACA residents were asked to respond to PUD zoning changes proposed by the developer in December 2014 (see sample survey). A summary of results and survey participant comments were forwarded to the Drenner Group, to City of Austin Planning and Development Review staff, and to District 10 council member Sheri Gallo’s office. 2015-Apr-08 Austin Neighborhoods Council Position: The ANC executive committee contacted City of Austin Mayor Adler, Mayor Pro Tem Tovo, and City Council members to register opposition to rezoning of the Austin Oaks property to a Planned Unit Development. 2015-Feb-18 Meeting with City Council Reps: District 10 Council member Gallo invited District 7 Council member Pool, neighborhood representatives, and area residents to discuss concerns. Suggested action item for the “four corner” neighborhoods: poll residents to gauge opinions on the proposed rezoning of Austin Oaks. Retail space: 90k sq. ft. retail inclusive of 60k sq. ft. restaurant space. Residential units: adding 300 apartments instead of 575 (adding 60–120 elementary, middle, and high school students to overcrowded schools). Building height: increased to 200 ft. max instead of 225 ft.
Density: increased to 1.4M sq. ft. instead of 1.6M (increase of 20k traffic trips per day instead of 25k). Mr. Drenner underscores PUD superiority requirements beyond current zoning standards and greater scrutiny than conventional zoning cases (see attachments here and here). He states that redeveloping under current zoning capacity (450,000 sq. ft.) will not be financially feasible to the property owner. This is contrasted with Jim Duncan’s calculation of 1,000,000 sq. ft. at full build-out under current zoning (see p. 5). 2014-Dec-16 Zoning & Platting Commission: PDRD staff’s request for an indefinite postponement was approved; ZAP commissioners are disinclined to set deadlines until a case is fully vetted. Since no definite date is set, neighbors will be renotified prior to the next public hearing. Staff will continue discussions with the applicant and neighbors and will provide a progress report to ZAP on February 17, 2015. 2014-Dec-12 Zoning & Platting Commission, public hearing December 16, 6:00 p.m. City Hall, 301 W. 2nd St. Residents opposed to the PUD are asked to email ZAP commissioners before December 16 stating that you OPPOSE an indefinite postponement of Case #C814-2014-0120 and believe that a 60 day postponement (to February 17, 2015) gives PDRD staff sufficient review time. On behalf of the Allandale Neighborhood Association, I write to state our opposition to the applicant’s requested rezoning from LO, SF-3, LR, and GR to PUD. The Allandale Neighborhood Association voted on September 3, 2014 to oppose the rezoning request as the PUD proposal is incompatible with adjacent neighborhoods, including Allandale. Allandale residents have raised a variety of concerns, including proposed impacts upon traffic, height (including viewshed blockages into Allandale), and the elimination of heritage trees, among others. 2014-Dec-03 ANA Executive Committee meeting: EC voted to respond to Zoning & Platting’s notice of public hearing by objecting to the Austin Oaks PUD rezoning. A comprehensive counter-proposal is expected to be provided by the development team at a later date, after which a second public community meeting was suggested. Together, the neighborhoods composed of Allandale Neighborhood Association, Balcones Civic Association, North Shoal Creek Neighborhood Association and Northwest Austin Civic Association have formed an Alliance to review and make recommendations on the proposed Austin Oaks PUD zoning request. The Alliance surveyed their respective residents, representing 12,660 households, who overwhelmingly request that the City of Austin Staff, Committees and City Council deny the proposed Austin Oaks PUD zoning request. Additionally each of our individual neighborhood associations have voted against the Austin Oaks PUD proposal. Below is our official position and I have also attached this in a word format for your convenience. We are open to discussion should you have questions. The NW Austin Neighborhood Alliance, composed of ANA, BCA, NSCNA, and NWACA, was formed to review and make recommendations on the proposed Austin Oaks PUD zoning request. The Alliance represents 12,660 households at the ‘4 Corners’ intersection of Spicewood Springs Road and MoPac where the Austin Oaks PUD is proposed (ANA-SE corner, BCA-NW corner, NSCNA-NE corner and NWACA-SW corner). 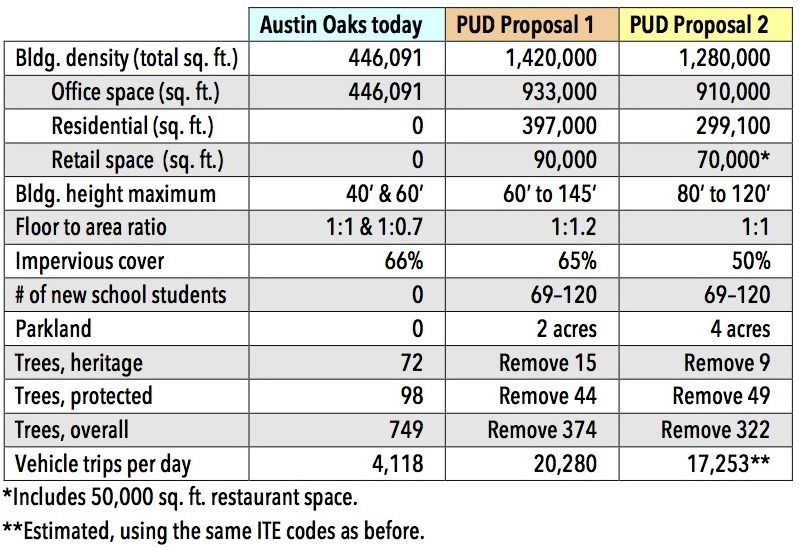 The Alliance surveyed their respective residents, who overwhelmingly requested that the City of Austin Staff, Committees and City Council deny the proposed Austin Oaks PUD zoning request. Does not meet the Imagine Austin Comprehensive Plan, which designates this area as a Neighborhood Center, the least dense of the activity centers. Adds an estimated 21,000 car trips over existing traffic. This corner of Spicewood Springs Road and MoPac requires careful attention to preserve the natural beauty of the abundant large native trees and wild plant materials found in similar areas of Austin west of the Balcones fault line. For the most part, the natural scenic beauty of the area has been skillfully and sensitively preserved as new developments have occurred and this concern is of the utmost importance in preserving the environmental quality of the neighborhood as parcels are developed. Topographically, the area is varied and interesting in character, which has resulted in a wide variety of commercial and residential designs, many of which have effectively taken advantage of the dramatic views of the hills and valleys in the western two thirds of the neighborhood and beyond. Over the years, the NW Austin Neighborhood Alliance has individually and successfully worked with numerous residential and commercial projects to ensure that the quality and natural beauty of the neighborhood is not lost. We continue to advocate to preserve the relatively uncluttered and natural wooded quality of the land while encouraging high quality and sensitive design of projects within the neighborhood and along its edges with improvements that enhance rather than detract from the environmental quality of the area. The proposed Austin Oaks PUD project does not fit the long term goals of our neighborhoods, it contributes more traffic on roads that cannot handle it, exceeds the capacity of our overcrowded schools, and removes too many trees. The NW Austin Neighborhood Alliance respectfully asks that you deny a zoning change for Austin Oaks case number C814-2014-0120. 2014-Sep-15 ANA Land Development Code Committee meeting: Presentation on Austin Oaks PUD by guest speaker Jim Duncan (CodeNEXT Advisory Group member) is available here. 2014-Sep-03 ANA General Membership meeting: Presentation on Austin Oaks PUD by NWACA residents Ann Denkler and Ben Luckens illustrating how the proposed development would negatively affect adjacent neighborhoods. More than 300 people attended the Community Meeting about the Austin Oaks PUD on Tuesday, August 19, and most were very actively engaged. Neighbors provided a clear message to the City staff and the developer’s staff that those present oppose the plans for the PUD they have outlined. The feedback forms gathered at the meeting show that 93% oppose, 4% are neutral, and 3% favor the planned PUD. Austin Planning & Development Review Department Presentation: A PUD is essentially a blank piece of paper; the City has a set of rules for developing them, but each crafts its own unique rules for the development of the property, including modifications (variances) to the City land development code, including flexibility over conventional zoning relating to height, density, building coverage, and impervious cover. Among the superiority areas the City looks for is a contribution to affordable housing (either on-site or fee in lieu). Drenner Group (Presenting for the Owner/Developer, Spire Realty): All of the Austin Oaks property is covered by the PUD application; the property is a total of 31.37 acres. The PUD plan incorporates aspects of Imagine Austin, the City’s comprehensive plan that was adopted in June of 2012. It has characteristics of a Neighborhood Center, is situated across MoPac from a projected transit center intended for light rail. Q&A Highlights: Most people had comments and questions about the density impact of planned residential use as well as office use: traffic, overcrowding of schools, height of buildings that were incompatible with the existing neighborhood, and anticipated higher taxes. Several questioners asked for additional research—such as meeting with AISD representatives, expanding the traffic analysis, getting more community input from working sessions with the developer. 2014-Jul-30 Documents related to the proposed Austin Oaks PUD to date are available here. Why the need for 14- and 17-story CBD-style building heights? How does a PUD benefit the community more than building out to current zoning? How do they meet Imagine Austin’s definition of a Neighborhood Center (the smallest)? What will the impact to schools be? Why is there so much office vs. retail? What percentage of residential is owned vs. rented? How is parking allocated and is it shared? How are traffic flow percentages derived? How will pedestrians get from the PUD to future commuter rail across MoPac? 2014-Jun-30 Drenner Group meeting: Representatives of ANA, BCA, NWACA, Williamsburg Charleston Place, and others met to hear the redevelopment plan presented by representatives of Spire Realty (the property owners). Current configuration: 450,000 sq. ft. office space in 12 buildings, 1–3 stories, on ~31 acres. Proposed: 1.6 million sq. ft.: office (878 k), retail (112 k), restaurant (10 k), residential (650 k: 36 townhomes, 2-3 story; 575 apts. 4-story), and parking structures. Heritage trees: 76 on-site; will ask to remove 9. Impervious cover: will build at 15% below allowable. Open space: will provide 25% above required. Community benefits: 3,500 jobs, public meeting space, considering park/playground, considering 10% units affordable (at 60% Mean Family Income). Parking: integrated and adjacent structures; some surface parking. Traffic: Access to MoPac managed lane; bike lane to Metro Rapid [on Burnet Rd]; expecting future light rail station east side of MoPac on Anderson Lane. Current: 450k sq. ft. office space = 4,248 trips/day. Distribution: 25% MoPac (N & S); 20% Spicewood & Anderson; 5% Hart & Woodhollow. 2014-Jun-16 Planning & Development Review Dept. : Received June 13, 2014 notice of completion of a project assessment report and presentation to the city council, case #CD-2014-0010, Austin Oaks Planned Unit Development, proposed zoning change. Location: southwest corner of Spicewood Springs Road and MoPac Expressway: 3409, 3420, 3429, 3445, 3520, 3636, 3701, 3721, 3724, and 3737 Executive Center Drive and 7601, 7718, and 7719 Wood Hollow Drive. This is about a proposed PUD. I couldn’t quite figure where it was in relation to Allandale (I couldn’t read the street names on the back of the notice), so I mapped it (see shaded area on the attached map). It’s across MoPac from Anderson Lane, but within 500-ft., which is why ANA received notice. This 30+ acre complex was purchased last year by Spire Realty Group (spirerealty.com) out of Dallas. Looks like the plan is to replace 12 existing 1970s buildings with all new construction. The development assessment file doesn’t give a lot of detail at this stage, but what really caught my attention was “proposed building height 225-ft.” That’s like 20 stories—skyscraper range in these parts. I don’t think I’ve seen anything higher than 7 stories outside Austin’s CBD. This is a rezoning request: from LO, LR, GR to PUD. Location: Spicewood Springs Road at MoPac. Proposed use: new townhomes, multifamily, retail, restaurant, office, structured parking. Will this reflect on the future development of Anderson Lane? This is the best summary on the Austin Oaks PUD so far. Thank you for taking the time to put it together. It is appreciated! !